Lands in Love - Tierras Enamoradas Hotel & Resort is an environmental and animal friendly zone. 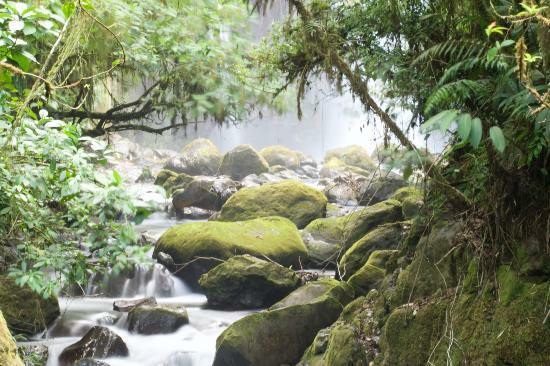 It invites you to Cloud forest, beautiful as a legend in hidden valley. This is a place of beauty that Lands in Love wants to share with you (and your pets if you are traveling with them). The hotel offers 33 pretty rooms with telephone, fast internet, TV, mini-bar and coffee maker and a its lovely lobby, with live music and open jam sessions. There is fine food for all, including those with special needs like weight watchers, diabetics, celiac etc. You can cook with them for the guests. The hotel has a beautiful swimming pool and Jacuzzi,. There is conference room available, a camping area and a pet hotel. From SJO take the highway north towards San Ramón. Turn to San Ramon and continue 32 km on route 272 toward La Fortuna. Follow the signs of "Lands in Love Hotel & Resort"
The hotel location is about one hour from San Jose Airport, central pacific beaches, and the Arenal Volcano. The staff, friends of many years, are vegetarians, animal and nature lovers, sharing a way of life that matures itself in this place.